Forms created in Google Docs can serve as Contact Forms on your web site. You can enable notifications to receive an email when the form is submitted. However, by default the email just tells you that the form was submitted without providing any of the content. Often it would be more useful if the email provided the values submitted in the form. Especially if you are receiving the email on a mobile device where Google Docs is not that easy to navigate. The following example assumes you've created a form with just two fields. 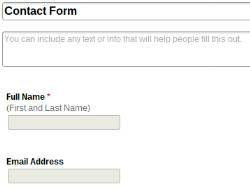 The first field for an email address, and the second field for a name. To make this run, you need to define a trigger. From the Script Editor click Triggers > Current script's trigger's. Add a new trigger to execute onFormSubmit, From Spreadsheet, On Form Submit. Save this and authorize the function when prompted. From the Google Spreadsheet click Tools > Notification Rules. Uncheck the box for notifying you when a user submits the form. While you are testing you may want to leave this box checked, just to make sure you don't miss any notifications. Now enter some dummy data in your form and submit. Check that the email comes through as you expected, and adjust the function to alter the subject or message as you desire. The above approach will let you receive notification emails when your Google Forms are submitted. The notification emails will contain the actual content submitted in the form. Exactly what I was looking for! I was raised on VBA, so suddenly having to learn a new language is a bit tricky - especially for someone who is the wrong side of 40! Keep the tips coming. Well, it doesn't work for me. The data is added to the spreadsheet as usual, but no email is received. 1. Does it matter where in the Code.gs file the new code is pasted? I just added it to the end. 2. Does anything in the code besides the email address need to be edited? 3. When I save the edited file, I am prompted for a new Project Name. I just used "FormSubmit Email" Is that OK? Does it matter? Sure hope you can help. And then run that by saving your changes and clicking Run > testEmail on the menu (in the Script Editor). When that runs it might prompt you to authorize the email (should be a one time thing) but you should get the test email (as long as you change the email address appropriately). If you do, then go back and try the form again. Does it matter if my column headers (the fields on the form) contains a space? (Like "Persons name")? No, it doesn't matter. In my example I had "Full Name" and "Email Address".